And that's just what they look like before transforming. The Macross franchise is a long running anime series created by Shoji Kawamori with designs made by Kazutaka Miyatake and Haruhiko Mikimoto. The general plot of each series concerns a conflict waged with Transforming Mecha (and usually involving aliens). In the middle of it all, The Power of Rock comes into play, as does the Power of Love, thus forming the three main elements of Macross: Humongous Mecha, superpowered music, and Love Triangles. The first show, Super Dimension Fortress Macross, first aired in 1982 under the Mainichi Broadcasting System. Since then, it has led to numerous sequels (both anime television series and OVAs), mangas, and video games. Super Dimension Fortress Macross, the original series, set in 2009. It is regarded as a classic among mecha fans, depicting a war between humanity and giant militaristic aliens known as the Zentradi. Macross: Do You Remember Love?, a movie adaptation of the original series, with significant plot and design changes. Despite that, it is regarded just as highly as (if not higher than) the original series itself. Macross: Flashback 2012, an extended music video clipshow for in-universe Idol Singer Lynn Minmay, which also acts as an epilogue to the series. Macross Plus, a short OVA (and later movie) sequel set in 2040 (thirty years after SDF), focusing on a contest between two prototype planes and a Virtual Idol; two paths that cross when three Childhood Friends meet up after seven years again. Macross 7, a full series sequel taking place on a colonization fleet in 2045, which encounters the enemy the Zentraedi were fighting before they met humanity. Something of a black sheep in the series due to being less serious in tone, with plot elements that push it toward the Super Robot Genre. Macross Dynamite 7, a short OVA sequel to 7, taking place in 2047 and focusing on thwarting a group of poachers trying to hunt literal Space Whales. Macross Zero, an OVA prequel to the original series set in 2008, depicting the tail end of the UN Wars mentioned in the series's backstory, and offering some more insight into the Protoculture and their contact with ancient humans. Macross Frontier, a full series sequel set in 2059, nearly 50 years after the original series. It is also set on a colonization fleet, and depicts humanity's encounter (and clash) with a new alien race known as the Vajra. Something of a "modern retread" of the original series in many of its themes. The False Songstress and The Wings of Goodbye are a pair of movie adaptations for Frontier. Like DYRL?, these movies follow a different plotline and resolution from the original show's. Macross FB7: Listen to My Song!, which acts as a sort of Crossover between Frontier and 7, while also serving as a Compilation Movie for the latter. Macross Delta, the fourth full series. It takes place in 2067 (eight years after Frontier) on a remote cluster of colony planets. It covers the exploits of Walküre, a group of Idol Singers whose songs can counteract a mysterious "disease" spreading around the colonies known as Var Syndrome, which causes extreme aggression and violent outbursts in those it affects. Macross II, an OVA and manga series that was made without the original creators' authorization, and has since been placed as an Alternate Continuity. The story takes place in 2090, nearly 80 years after the first series, and follows a news reporter as he gets caught up in a war against the Marduk, who use enslaved Zentraedi soldiers to fight for them. It is probably worth mentioning the Robotech series is often associated with Macross by Americans due to Robotech's initial (and most famous) arc being an altered version of Super Dimension Fortress Macross. However, Robotech is a separate franchise and is not considered part of the Macross franchise by any stretch. Bridge Bunnies: The term was originally coined by fans to refer specifically to the female bridge crew of the original Super Dimension Fortress Macross. Macross Missile Massacre: In fact, one of the main animators of the earlier series was Ichiro Itano, the very man who pioneered the MMM's most common aesthetic look. Roboteching: Sort of... the Trope Namer is technically Robotech, but the name came from the Macross-based part of the series. Ace Pilot: While the protagonists do all end up becoming highly skilled pilots in their own right, the franchise has an interesting tradition of having the best pilot in any given series not be the main character. All There in the Manual: A good amount of background material covering the science and technology in each series as well as the events that take place in between them is revealed in the various editions of the official Macross Chronicle data books. Artificial Gravity: It's how massive cities that look like normal cities on Earth can exist inside spaceships. Background Magic Field: Fold Waves, a naturally existing energy wave in super dimension space that travels effectively Faster-Than-Light. This serves as the basis for the series's main form of Faster-Than-Light Travel (folding into super dimension space). Additionally, the ability of certain people to generate this through song (Human Space-Time Resonance, also known as Fold Receptor Factor) is used to explain the more mystical things added to the franchise such as Anima Spiritia from Macross 7 and the Mayan priestesses' powers in Macross Zero. Black Sheep: Either Macross 7, which was much lower-budget and more Super Robot-like than the rest of the franchise, or Macross Zero, which is far more character-focused and lacks an emphasis on J-Pop music, instead having tribal island hymns. Broad Strokes: Macross tends to play fast-and-loose with canon. This started as early as the original series vs its movie adaptation Do You Remember Love?, which depict the same war but with vastly different events taking place. Macross Frontier and its movie adaptations similarly depict mutually exclusive sets of events coming to pass. Macross 7 tried to explain away Do You Remember Love? as an in-universe movie, thus rendering its progression of events fictional, but the Zentraedi keep their movie exclusive designs and ships, rather than the original series' look. Conspicuous CG: While the original series, Plus, and 7 are almost 100% hand-drawn, the entries from Zero onward instead use CGI to render the mecha, with Frontier in particular making liberal use of Cel Shading. Cool Plane: When the series isn't showcasing Humongous Mecha, it's showing off incredible dogfights between futuristic Space Fighter jets (which transform into Humongous Mecha) referred to as "Variable Fighters". Cool Starship: The franchise's eponymous Macross and New Macross-class ships. Which also transform into Humongous Mecha. Deconstruction: The TV series tend to take the popular anime and Idol Singer tropes on their day and deconstruct them. Decon-Recon Switch: After deconstructing those tropes, the series will happily reconstruct them as the finale nears. Enhanced Punch: The SDF-1 can focus its forcefield on its fist to give it a powerful punch into an enemy's hull, where it then unloads its missiles into the enemy. Later Macross and New Macross-class ships, as well as smaller mecha like the Macross Quarter and even later models of Variable Fighters, can also perform the same maneuver (except the VFs generally lack the missile part). Faster-Than-Light Travel: Done by "folding" into "superdimensional space", with long jumps eating up a lot of power (which is part of why humanity's FTL-capable colony ships still often take generations to find a habitable world). Generation Ships: Form a major part of the setting, with several series being set on them. Unusually for the trope, they're FTL-capable; it's just that long jumps still take a lot of time to complete and recover from. Half-Human Hybrid: Due to the prevalence of Interspecies Romance and Human Aliens, human-alien hybrids become increasingly common in the shows taking place after the original, to the point where it's barely noteworthy by the time of Frontier and Delta. Human Aliens: Almost all intelligent species in the galaxy, humans included, look similar to the Protoculture. Justified as the Protoculture messing with everyone's evolution to make them look that way. By later series, humans and Zentraedi have integrated so much culturally and genetically that it's hard to see the latter as "alien" anymore, especially once other Protoculture derived races appear that show even more physical differences. The only known exceptions are the Vajra and possibly the Gyararashi (it isn't clear whether the latter have animal or human-level intelligence). Inertial Dampening: Starting from Macross Frontier, most variable fighters now have something called the "Inertia Store Converter" that not only functions as this, but converts inertia into extra power. Averted in earlier shows. The lack of this actually plays into the plot of Macross Plus. Love Triangle: One omnipresent trope in the series is the love triangle: pretty much any Macross story is guaranteed to have this in some form or another. They usually avoid becoming a Romantic Plot Tumor, as equally as much attention is paid to the characters' relationships as is paid to the overall space opera. Magic Music: With the possible exception of the original series, music tends to do things which border on this, though it's usually explained as being a product of Fold Waves and Fold Receptor Factors. Meta Casting: The up-and-coming Idol Singer character in any given series is usually voiced by a real life up-and-coming singer/voice actress; examples include Mari Iijima voicing Lynn Minmay in Super Dimension Fortress Macross, Megumi Nakajima voicing Ranka Lee in Macross Frontier, and Minori Suzuki voicing Freyja Wion in Macross Delta. Mini-Mecha: The ubiquitous Zentraedi battle pods/suits may be Humongous Mecha from a human perspective, but for their giant-sized pilots, they straddle the line between this trope and Powered Armor. Due to this trope, the series uses the term "Reaction Weapons" instead. Word of God is that these are actually anti-matter pair annihilation weapons that are, ironically, more destructive than nuclear weapons. When this was pointed out to Shoji Kawamori, he simply stated that "Nobody's protesting about anti-matter weapons". Later series seem to have traded out Reaction Weapons in favor of Fold Weapons as the fictional WMD of choice. Fold Weapons are even more destructive than antimatter bombs, given that they operate by distorting space-time and are capable of planetary-level destruction. 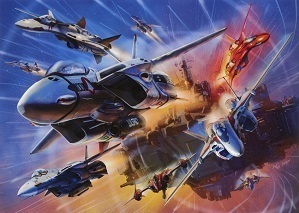 Old School Dogfight: A franchise staple is the clever combination of this trope with Transforming Mecha, which leads to some very creative maneuvers involving partial transformations. One-Word Title: The franchise as a whole is simply known as Macross, though the individual series avert this. Our Giants Are Bigger: The Zentraedi, a race of thirty-foot-tall Proud Warrior Human Aliens who have appeared in every series (with the exception of Macross Zero) and come to make up a significant portion of the (New) United Nations' population. The Place: The eponymous Macross-class spaceships, which usually act as home base for the main characters. Precursors: The Protoculture, who play a key role in the franchise's main Myth Arc; they were responsible for the evolution/creation of what seems to be every single sentient humanoid species in the galaxy, including humanity, and their powerful relics and ruins can still be found all throughout the Milky Way. The Power of Rock: The other ubiquitous trope in the franchise is music and singers playing a major role in the central conflict. It isn't always rock music, but that gets used a lot since it tends to go very well with incredible aerospace battles. Real Robot Genre: It straddles the line between this and the Super Robot Genre. There are a number of fantastic plot elements but the technology and pseudo-science is mostly internally consistent, even if it resorts to Hand Wave on occasion. Yes, this includes Macross 7; Super Robot-y as it is, the ideas it introduced to the series are picked up and used (in a more subdued manner) by later stories. That said, what truly keeps the franchise primarily in the Real Robot category is that even its most advanced mecha are never treated as anything more than advanced prototypes or custom-modified mass production models. Riddle for the Ages: Exactly what happened to the Megaroad 01, and with it, the original series cast? Thirty real-life years later and nearly fifty in-universe years later, and all anyone knows is that it disappeared without a trace a few years after its launch. No Macross series touched that plot thread until Delta, which dropped some vague hints that seemed to relate to it near the end of its run, but the actual answer is still left ambiguous. Rubber-Forehead Aliens: While all humanoid species in Macross closely resemble humans, some still have a few clearly non-human features, like fins, tails, tentacles, etc. Settling the Frontier: The series set after the original primarily take place on Colony Ships and/or distant planets far away from Earth. Shoji Kawamori was an engineering student and, according to some sources, graduated with a degree in aircraft engineering. The result is that most of Macross's variable fighter designs have very plausible looking fighter modes compared to most Transforming Mecha. Whenever a Macross or New Macross class warship are configured in assault (humanoid) mode and land on a habitable planet, the vessels rest in large bodies of water. This is because the ships are unable to structurally support their own weight over long periods in this configuration within Earth-like gravity or greater. The ships are also still buoyant and their center of gravity, as well as carrier arms, keep them upright. Sliding Scale of Idealism vs. Cynicism: Though the franchise engages in a fair amount of Deconstruction, it is ultimately very much on the idealistic end of the scale, with its themes of how understanding, love, and music can overcome all odds and convert the most alien of foes into friends. Source Music: There's plenty of moments throughout the franchise where the music the audience hears is also being performed in-universe, since each series has at least one main character who's a singer of some kind. Space Navy: The (New) United Nations Spacy* Space Navy, or (N.)U.N.S. Spiritual Antithesis: Oddly, its American adaptation, Robotech, became this as their timelines progressed. In Macross, the Zentraedi become more like humanity, while in Robotech, thanks to repeated invasions, humanity is becoming a warrior race like the Zentraedi. This is no more clearly on display than in their respective versions of the climactic battle against the Zentradi. In Robotech the attack is headed by Minmay singing a song about winning victory in battle. In Macross the attack is headed by Minmay singing love songs. Yes and no. In Macross, aside from combat, activities involving Variable-Fighters can range from local high-school clubs to galactic sporting events. Operating Variable-Fighters is actively encouraged due to pilots often being the first line of defense when any NUN territory is on the receiving end of an alien invasion, or the first line of attack in efforts to pacify hostile alien species as NUN expands its influence. Super Prototype: Averted; while we do see plenty of fancy prototypes, that's because they're usually test units for future mass-production models, which themselves often end up being superior to their prototypes. Transforming Mecha: It was among the first Real Robot series to feature transforming mecha, and the Macross itself was, at the time, the largest transforming mecha that had ever been seen (over ten times larger than the next contender). The popularity of the original's toyline (helped by the fact that Shoji Kawamori helped Takatoku make an actual transforming Valkyrie toy) may have helped popularize this trope, seeing as Takara made their Diaclone line in response to this, that later became the basis for the Transformers. Translation Convention: It is strongly implied (and sometimes outright shown) that all the human characters are actually mostly speaking in English, as evidenced by most of the in-universe text that's shown onscreen. Additionally, it's implied that the aliens are using their own native languages whenever they're speaking among themselves, as evidenced by the fact that each species has been shown to have its own writing system, with several favoring them over, say, the Roman alphabet or Japanese characters. This may be true to an extent especially in Macross Zero and SDF Macross. However, after Space War I, human colonies grew more diverse and each colony now sport a specific cultural heritage, including language. Moreover, since the Zentradi (friendly to humans or otherwise) are numerically superior to actual humans, it is implied that the galactic Lingua-Franca is actually Zentran by the time of Macross PLUS. United Nations Is a Superpower: Humanity is united under the rule of the (New) U.N., which grows to incorporate a number of other species. Wave-Motion Tuning Fork: The incredibly powerful signature weapon of the franchise's eponymous Cool Starship is a defining example of this in anime.